Daniel Oturu made it pretty clear where he thought he and Gophers teammate Gabe Kalscheur belong among a loaded class of Big Ten freshmen this season. 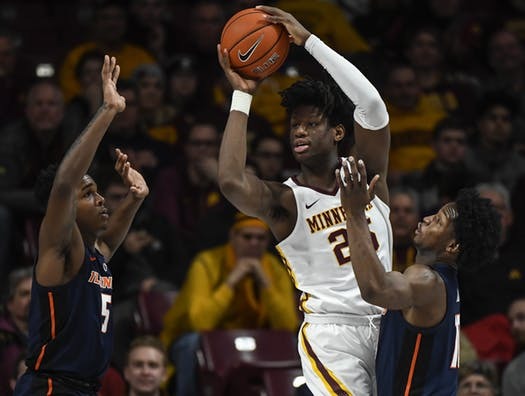 “Personally, I feel like me and Gabe had a really good season,” Oturu said after Minnesota’s 69-60 loss at Maryland to finish the regular season. Neither Oturu nor Kalscheur were selected to the All-Big Ten freshman team Monday, which included Michigan’s Iggy Brazdeikis (freshman of the year), Indiana’s Romeo Langford, Illinois’ Ayo Dosunmu, Maryland’s Jalen Smith and Iowa’s Joe Weiskamp. The former Cretin Derham-Hall star averaged 10.8 points and led all Big Ten freshmen in rebounding (7.2), field goal percentage (54.7) and blocks per game (1.4) this year. His seven double-doubles were also the most for any freshman in the conference. "At the end of the day, all that matters is that this team continues to move in a positive direction!" Oturu posted Monday on Twitter after followers were upset he was left off the Big Ten all-freshman team. Gophers coach Richard Pitino addressed Oturu not getting selected as one of the top five freshmen in the league by the coaches. This was the second year with no Gophers picked as all-league freshmen after back-to-back seasons with Jordan Murphy in 2016 and Amir Coffey in 2017. "I think he was close," Pitino said. "But Jalen Smith had a terrific year. Weiskamp or Daniel could’ve gone either way, but Iowa finished ahead of us.I’m sure Daniel’s not happy about it, but get over it. You’ve got bigger goals. Amir probably thinks he’s a little bit higher (was picked All-Big Ten third team), but move on." What was Pitino's advice to Oturu and Coffey if they were upset about the All-Big Ten picks? "If awards matter to you and personal recognition matters, win more, play better," he said. "Nobody’s out to get you." Kalscheur’s impact wasn’t far behind Oturu’s for Minnesota. The 6-4 former DeLaSalle standout averaged 10.1 points and led the team in three-point shooting percentage (41.5) and three-point field goals (68). The latter also was the most for any Big Ten freshman. Kalscheur was also the U’s top perimeter defender. He often guarded the best offensive player from the opposing backcourt, which included twice holding his own against the Big Ten’s leading scorer Carsen Edwards from Purdue. Fellow Minnesotan and Gophers freshman Jarvis Omersa, who was an AAU teammate of Oturu and Kalscheur in high school, had an important role on the team as well. Despite not being in the primary rotation this year, Omersa was the team’s emotional leader. Did Oturu or Kalscheur deserve to be on all-freshman the team this year? Let me know what you think. The Gophers (19-12, 9-11) open the Big Ten tournament Thursday against Penn State in the No.7-10 game in Chicago.